Recorded late in 2018 during a rare break at the height of her Tell Me How You Really Feel world tour, 'Everybody Here Hates You' is the closest Barnett has ever come to capturing the extraordinary weight and swagger of her live performance on a recording. This is unadulterated rock and roll; a rollicking paean to depression and self-belief; a blues tinged behemoth with squalling guitars, organs and tambourines. 'Everybody Here Hates You’ will soon be accompanied by a brilliant video by Barnett’s frequent collaborator, the award winning director Danny Cohen. The cinematographically stunning video ingeniously takes you inside Barnett’s brain as it slowly implodes. The song comes just weeks after Barnett was announced as part of an incredible Splendour In The Grass line-up. Courtney Barnett made history last year when her album Tell Me How You Really Feel saw her become the first ever solo female artist to win the Best Rock Album category at the ARIA Awards. Barnett’s achievement was all the more significant given the fact that she released her album independently through her own label Milk! Records. 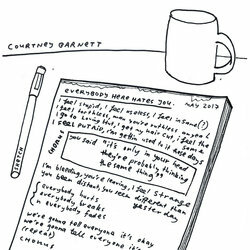 'Everybody Here Hates You' features one of the most anthemic sing-along choruses Barnett has ever conjured, with a lead vocal that brings new strength and range to her unmistakable voice. The single is the superb final instalment from the creative period of Barnett's life which gave birth to her acclaimed and adored sophomore album Tell Me How You Really Feel.